New Release | Barbara Korte & Stefanie Lethbridge: "Heroes and Heroism in British Fiction Since 1800"
This book is about the manifestations and explorations of the heroic in narrative literature since around 1800. It traces the most important stages of this representation but also includes strands that have been marginalized or silenced in a dominant masculine and higher-class framework. The studies include explorations of female versions of the heroic, and they consider working-class and ethnic perspectives. The chapters in this volume each focus on a prominent conjuncture of texts, histories and approaches to the heroic. Taken together, they present an overview of the ‘literary heroic’ in fiction since the late eighteenth century. Freiburg researchers at the Collaborative Research Center 948 “Heroes – Heroizations – Heroisms” are looking into heroic figures across history, visual studies, literature and the social sciences from Ancient Greece to today. “We have determined that heroes are much more than just role models who have accomplished something extraordinary”, explained the classical archaeologist Prof. Dr. Ralf von den Hoff, speaker of the SFB. “Heroes are polarizing figures and also embody the negative sides of conflicts.” In the second funding period, which began in July 2016, the researchers have turned their attention to the 20th and 21st centuries as well as transcultural connections. The interview in its entirety can be viewed on the following page. New Release | Achim Aurnhammer & Ulrich Bröckling: "Von Weihegefäß zur Drohne"
The fourth volume in the SFB 948 series "Helden – Heroisierung – Heroismen" (Ergon-Verlag, Würzburg) has been released: "Vom Weihegefäß zur Drohne: Kulturen des Heroischen und ihre Objekte", edited by Achim Aurnhammer and Ulrich Bröckling. Further information can be found on the SFB Publications page and the publishing house's website. New Release | Ralf von den Hoff, et al. : "Imitatio heroica: Heldenangleichung im Bildnis"
The first volume in the SFB 948 series "Helden – Heroisierung – Heroismen" (Ergon-Verlag, Würzburg) has been released: "Imitatio heroica: Heldenangleichung im Bildnis", edited by Ralf von den Hoff, Felix Heinzer, Hans W. Hubert and Anna Schreurs-Morét. New Release | Ulrich Bröckling, et al. : "Das Andere der Ordnung"
Das Andere der Ordnung: Theorien des Exzeptionellen, edited by Ulrich Bröckling, Tobias Schlechtriemen, Matthias Leanza and Christian Dries, has been released. Bröckling, Schlechtriemen and Dries constitute the research team of the SFB 948’s sociology project, "The Hero as Disturbing Element: The Sociology of Exceptionality" (B7). New Release | Katharina Helm, et al. : "Künstlerhelden?" Künstlerhelden? Heroisierung und mediale Inszenierung von Malern, Bildhauern und Architekten, edited by Katharina Helm, Hans W. Hubert, C. Posselt-Kuhli and Anna Schreurs-Morét, has been released. The editors constitute the research teams of the SFB 948’s art history projects (A4 and B3). New Release | Thomas Seedorf: "Heldensoprane"
The first volume of the SFB 948’s “Figurationen des Heroischen” series has been released: Heldensoprane: Die Stimmen der eroi in der italienischen Oper von Monteverdi bis Bellini by Thomas Seedorf. Seedorf is the leader of Project A7, “The Voice of the Hero: Vocal Presentation of the Heroic in the Opera During the First Half of the 19th Century”. Click here for an overview of SFB publications and here to go to the publisher's website. 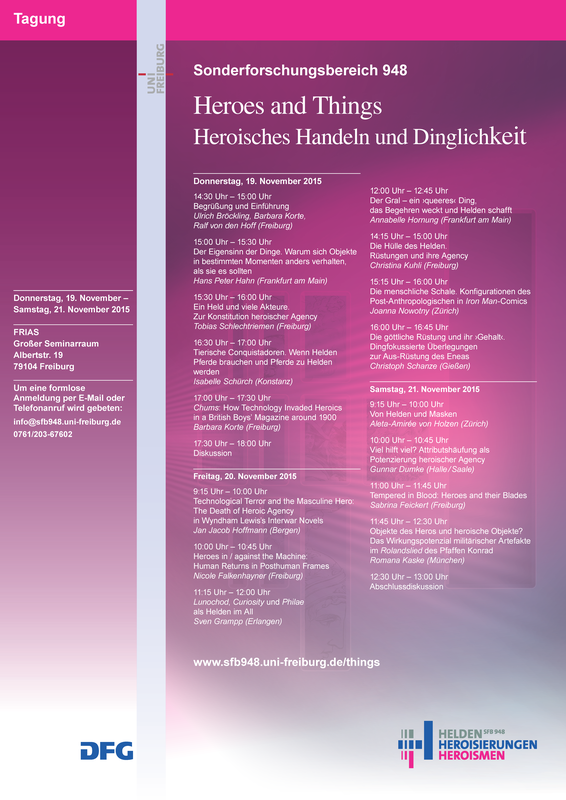 Conference Programme | "Heroes and Things"
The conference programme for "Heroes and Things: Heroisches Handeln und Dinglichkeit" (Thursday, November 19 – Saturday, November 21, 2015) is now available, along with all other organizational information. Prof. Dr. Barbara Korte, leader of projects C3 and C4, gave an interview which was published in the first issue of Reihe 5: Magazin der Staatstheater Stuttgart. 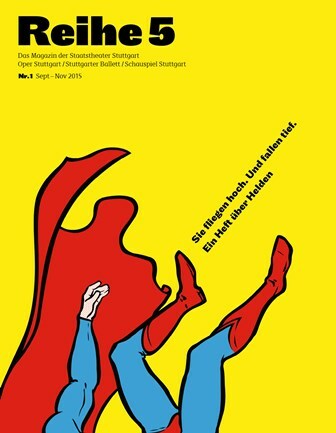 Prof. Dr. Ulrich Bröckling, leader of Project B7, "The Hero as Disturbing Element: The Sociology of Exceptionality", gave an interview to the Deutschlandfunk Kultur radio station on August 31, 2015. The program is called "80 Jahre Stachanow-Norm: Wie sieht ein Held der Arbeit heute aus?" (translated: 80 Years of the Stakhanov Norm: What Does a Hero of Labor Look Like Today?) The interview is in German.